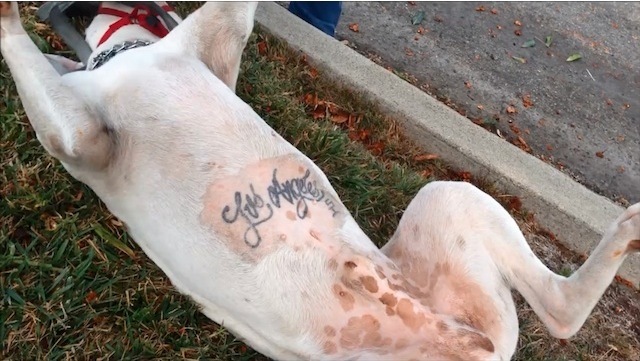 In an unbelievable example of merciless animal abuse, an abandoned puppy was found with a large gang tattoo across its belly. The nine-month-old pit bull, since named Petey, was found last month crying in a back alley, tied to a pole outside of doughnut shop in the Los Angeles city of Lomita, the Daily Breeze reported. After calling the police and animal control to no avail, the woman who found Petey, Elizabeth Vivlamore, took him to the vet and discovered he had fleas, worms, an ear infection and his tail had been broken in several places, CBS reports in the video above. ROMP Rescue, a Van Nuys-based nonprofit, picked up Petey and made a disturbing discovery. After shaving him, the rescuers saw the large gang tattoo across the young pup's belly. The rescuers do not believe that Petey was sedated at all before receiving the tattoo. Randy, a man affiliated with ROMP, suspects Petey was used to train fighting dogs, also known as a "bait dog." "What they do is make the [bait] dog defenseless, and they'll tape its mouth shut with electrical tape, throw it into a fighting ring and the other dogs destroy it," Randy said to CBS. "He's a good dog. He's so loving and affectionate," a tearful Vivlamore said to CBS. For adoption and other information on Petey, visit the ROMP Rescue website. To rescue a dog in Los Angeles, click here.